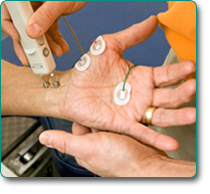 What is Electrodiagnostic Testing (EMG/NCS)? Electromyography, or EMG, is a diagnostic test that the physician may order to assess the electrical activity of muscles. Often, EMG testing is performed with another test that measures the conducting function of nerves. This is called a nerve conduction study. Both tests are generally done at the same visit in the same room. There are some medical conditions that the muscles or nerve’s electrical activity is not normal. This could be due to nerve compression (pinched nerve), an injury, nerve root injury, or other problems or diseases of the muscles or nerves. Performing an EMG/NCS can assist the doctor in ruling out a suspected condition or confirming a diagnosis. The electrical impulses and needle examination can both be somewhat uncomfortable. However, generally there is no risk from the procedure and no side effects. Local muscle soreness post test may be present for several hours. ARA has a highly trained neurologist that conducts these tests at our locations on specific days of the week. If your physician orders this test, we are happy to schedule your test at one of our locations or refer to another facility for your convenience.